3.7 out of 5 based on 41 bloggers and 6 commenters. 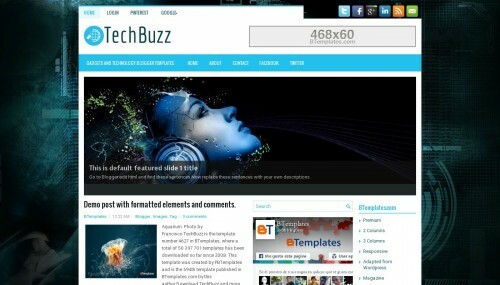 TechBuzz is a free blogger template adapted from WordPress with 3 columns, responsive design, magazine-styled, right sidebar, ads ready, footer columns, slider, social bookmarking icons, posts thumbnails, tabs, breadcrumbs, related posts support, abstract and 3D effect. Excellent template for blogs about games, internet, news or science. How can I alter widths of this template? the template is simply awesome for tech related websites and blogs.